Nath Knits – in England! 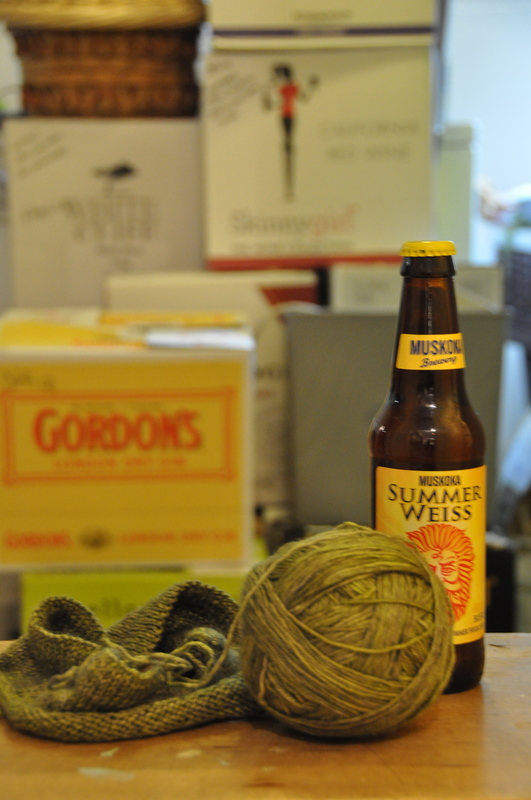 Lazily crafted shot of what I’d like to be doing vs. what actually needs doing, looming in the background. As many of you know, we’re heading to England for a year starting in about four weeks. The past few months have been busy with preparations to that effect, from doing small home repairs to make the place tolerable for paying tenants, to major home renovations, to paperwork, to packing. This was made a little easier by the fact that I was laid off from my job in February. Still, there’s a lot left to do. And the weather’s been hot lately, which turns me into a giant slug-monster. But it’s all getting done. And despite months of preparations, and the acquisition of visas and plane tickets, it only really hit me early last week that this is actually happening, when we went to the OHIP office to notify them that we’re heading out on an extended absence. Every time I hang out with friends or family, or enjoy some (recently repaired or spruced up) part of my house, or go to my Kettlebells class (to which I’ve grown weirdly attached), or participate in some community event, I realize I won’t be doing that again for a whole year, and it makes me a little sad. However, I’m very much looking forward to the adventure. And I feel very fortunate that we’re able to do something like this at all. Disclaimer: While I finished all these during the hiatus, I didn’t start them all in that time. A few socks in particular had been lingering for a while. Without exception, all the crocheted stuff is for Spinrite. After I got laid off, I called them and asked if they had home work for me to do (I quit them a few years ago when things got too busy, and I couldn’t stand the thought of another crocheted granny square afghan). They went crazy! I was crocheting an afghan every week to two weeks for a while. I just sent back my last project for them this week. While working for them isn’t my favourite, it was nice to get the extra cash. Though the pay is still lousy, and they’re fairly disorganized. I have a couple of projects on the go – a hat for my step-dad that just needs eyes (it’s this one), a scarf for me (this one. It makes me remember why I don’t generally knit scarves. Dear god, but they’re boring and they go on forever), and a sweater of my own devising that I just started yesterday after having ripped back a mostly done Laika that just wasn’t working out. I’m reverse-engineering it, with modifications, from this pattern. You can see the yarn and what I’ve completed of the sweater in the picture at the top of the post. People have asked me if I’m bringing yarn to the UK when we go. I’m not. Well, except for whatever I’ll be working on during the flight to keep from going postal. I’m bringing my needles and hooks, and one hardcopy pattern book I want to have with me. Because Ravelry is awesome, I have electronic copies of many of the books I own there, so I’ll have access to them while I’m gone. And they know a thing or two about yarn in the UK, so I shouldn’t lack for stuff to work on. I’ve also been asked if I’ll be singing while I’m there. I already miss my choir, and it’s only been a month or so since it’s been over for the season. The answer is, I don’t know. I have done a little research into choirs in London. Turns out, they also know a thing or two about choral music in the UK. I don’t know if I want to prepare an audition. I’m toying with the idea of taking singing lessons during the year instead. They’d certainly do me good, but I’m not sure I can afford it. We’ll see. For now, I’ll just have to stick with embarrassing my kids by singing loudly while I do the dishes. I’ve also been asked if I’ll be working. I’m not legally allowed to, but I may find some volunteer work once we’re settled, just to keep myself from going crazy. The only reason this particular bout of unemployment (or semi-employment, in the early days) worked out is because there’s enough to do around the house to get ready to leave. London will have plenty to offer to distract me, I’m sure, but I need to contribute to something outside my household. The plan for this blog is that I’m going to continue to post here, but with a focus on our British adventure, as well as the knitting. I also promise more pictures. Sorry about the long delay. Thanks for reading!